I took this picture from a hotel window in Shanghai. As I scanned the scene with the telephoto I came across the guy you may just be able to see in the top right hand corner. He seemed to be looking straight at me. I quickly reframed and set the exposure for a slow shutter speed and hoped he would remain staring while I made a picture - which he did. No matter how many, there would always be something new to discover about this fantastic city. It is giving NYC a huge nudge as my favourite big city. And this place is big – I visited the Oriental Pearl Tower early in the visit and from its 263m viewpoint there have 360 degree views of all Shanghai (allowing for clouds and smog of course). It’s sobering to think that you can “see” the population of Australia during a short walk around the tower. The Pearl Tower looks like it was lifted right out of The Jetsons – in fact much of the Pudong Financial District would qualify for any movie set 100 years in the future. To view it at night from The Bund waterfront is a surreal experience. The tallest hotel in the world is there beside what will become the world’s tallest building when it is finished. There are two giant globes that are illuminated, as are all of the other skyscrapers. One becomes a giant TV with over 2/3rds of its 60 plus floors showing pictures of birds, wildlife and advertising (of course). While watching the lights last night I was so engrossed with the view and chatting to a uni student who was practising his English on me that it was well after dark when I turned around to face the old colonial buildings of The Bund. These were also lit up so as to emphasise every nook and cranny of the elaborate architecture of times past. It was an electrical face-off between old and new at one billion watts! Throughout Shanghai most buildings are lit and everywhere are bright neon advertising signs. My room (in the Seventh Heaven Hotel) looks across to other hotels and down Nanjing Lu and its famous Walking Roadway (mall to the rest of us). At the moment it is holiday season – celebrating the Mid Autumn Moon and China’s national day. 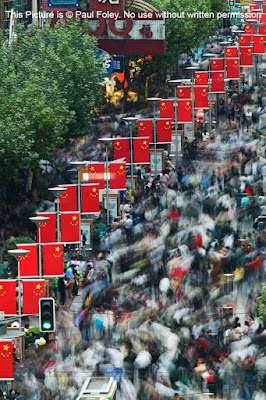 Nanjing Lu is packed by day and even more crowded at night. It’s a big friendly crowd of families, teenagers and chic young Chinese. The big thing at this time of year is to buy large inflatable bats, hammers or gloves and engage in running battles of bopping people. In most places this would develop into violence, here it is just fun. You don’t so much walk down Nanjing Lu at night – you flow along with a river of people, from time to time slipping from the stream to enter an interesting shop or bar. So I guess you can tell I like this place and there is plenty of it to like. What’s not to like about being invited to a Chinese family’s home for the Autumn Festival (like our Christmas). We arrive as the chef (loaned by the University where Chung, our host, works) peddles up on his bike with a box of goodies on the back and are graciously welcomed into a small but modern high rise apartment. 30 courses later – all produced in a kitchen smaller than mine) we are offered still more. Life here, like the other parts of China I have visited is full of paradox and contradiction. It is noisy, almost manic at times yet friendly and helpful to even a gringo who should know more of the language than he does. I went to the inaugural F1 last Sunday (alone) and though armed with instructions written in Chinese to show to bus drivers and taxi drivers, ended up a long way from where I should have been when I got back to the city. It was impossible to get a taxi so I headed to where I thought I would find the Metro (subway). I don’t know why I thought I would have any idea which direction was which but I plundered on regardless. I eventually did find a station and stood at the steps, my Lonely Planet open and with real trepidation about entering the void below when a young woman with good English asked if she could help. I explained and she took me down the stairs to what was not just a subway station but also a massive underground shopping centre. The walk to the line I required was about a kilometre out of her way but she took me anyway, helped me buy a ticket, explained how the maps worked, where I would have to change trains and which exit I would need to use at my destination. Using the wrong exit at some of the subways can bring you to the surface many blocks away from your intended street. I thanked her with profuse and badly pronounced xiexie’s – she just smiled and went back to her shopping. I like to travel with an open mind and you need to do that in a place like China – things that are polite in Oz or of no consequence can be highly insulting to a Chinese person. The people who have organised the trade mission (which finished a few days ago) have been so professional in teaching us the ins and outs of communication, customs and eating manners – I wish I had had some of this info for my first trip. I have had several meetings that have gone well and show promise but things hurry slowly here and the Chinese need to respect you to do business with you. So far I seem to have made the right impressions (according to our Chinese contact here) – of course I mainly kept quiet and tried not to make too much mess with the chopsticks! Since the others have left I have been eating mostly at local eateries – sometimes I get what I think I ordered at other times I have to take the approach of if it tastes good and smells good do I really need to know what it is? Of course this is how I came to enjoy ningshi shanyu (stir fried eel and onion). Across from the hotel is the best wonton and dumpling breakfast place in Shanghai. These last days I am busy making pictures so I am travelling by taxi a lot. Ni the local businessman who has lots of contacts throughout Shanghai has written all the places I want to visit in Chinese and I just show the driver. Fares are mostly 15 Yuan (around $2) so it’s an affordable way to get around. I also use the subway but haven’t tried a (always crowded) bus yet. Road traffic is a writhing, honking jumble of cars, trolley buses, trucks and bikes. No one indicates or obeys lights – pedestrian crossings have no status, lanes are meant to weave across and no one stops to enter traffic. It all just happens – much like the rest of Chinese life. A taxi ride will be the best 15 Yuan you will ever spend! The honking is mainly a courtesy hardly ever a demand - cars weave around bikes and pedestrians with the fluid grace of the ballroom dancers who can be found every morning on The Bund or near the spectacular Opera House. Oh- I didn’t mention the ballroom dancing did I? I also haven’t mentioned possibly the worst bar in Shanghai – which is its actual name and it lives up (or down) to it. Of course with a name like that we had to go in and if you are ever in Shanghai and accidentally wander by you probably will too. Look for my business card (Chinese version) on the ceiling.